When you’re in between housing, you want a true home away from home to make the transition easier. 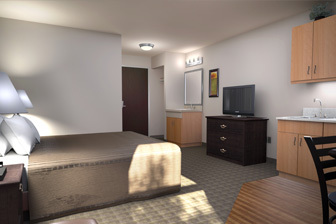 This extended stay Anchorage hotel is brand new with great amenities at a value-driven price. For Alaska’s largest, most thriving metro, our rates are beyond compare and can help guests save while looking or waiting for their permanent housing. With a military base nearby, many of Aptel’s guests are military families transitioning to or from military housing. Most guests are business travelers, some of whom need comfortable and spacious temporary housing while they look for their permanent Anchorage home. There’s also the university just a few miles away. Students, faculty, and staff deserve a clean temporary home while searching for a permanent solution. Tourism doesn’t just bring travelers to Anchorage temporarily—many fall in love with the region and move here permanently. If you’re building a home here, make the most of your waiting period at an extended stay Anchorage hotel that offers weekly housekeeping, vending machines, and is just 2.8 miles from downtown. Options for queen or double queen rooms (with mobility options for both).